Here for you today we have one of my favourite styles; Gose. The style is making a comeback after nearly dying out forever in the 1960's. After it's revival in the 80's, more Gose is now made outside of German than within. So what is Gose; it's a German sour style of beer made with at least 50% wheat initially from a small town called Goslar, before being popularized in the more substantial city of Leipzig. Interestingly Gose is not compliant with the Reinheitsgebot, due to the added salt and coriander, but is allowed as a regional speciality. 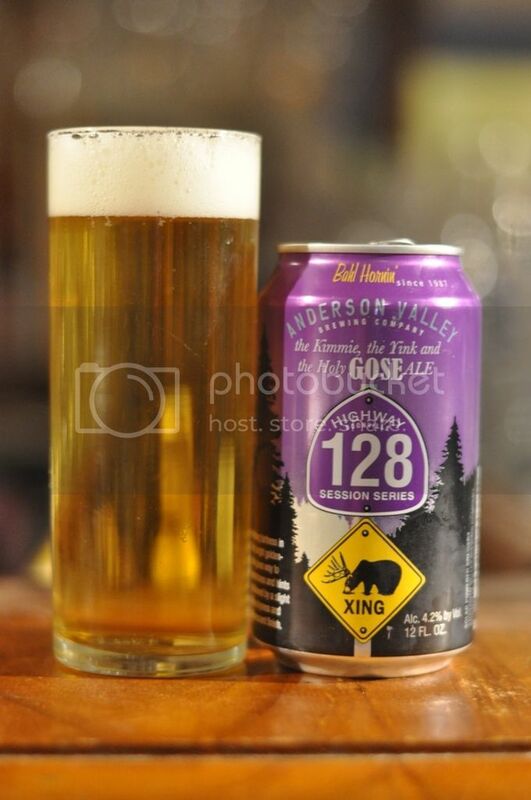 Today's offering is from Anderson Valley Brewing Company in California. The beer pours a lovely translucent golden colour with a brilliant white head, There was plenty of carbonation rising to the head, which fueled the excellent head retention. The beer lightly laced the glass, although it wasn't particularly obvious. It's a nice looking beer, although from my understanding of the style, a Gose should be cloudier. Onto the nose and this is more in-line with what I was expecting. It's got a slightly sourdough flavour at first along with some citrus, coriander and salt. As the beer warms the saltiness becomes more and more prominent. The beer smells wonderful, although it's not a particularly strong - something that may appeal to people not familiar with Gose as it can be a bit of a shock to the system. Anderson Valley's Gose has great flavour to it. There is the sourdough flavour that the nose indicated which is quite salty. There's some unexpected, albeit light, tropical fruit flavours accompanying a distinct lemon flavour. It's not massively sour, but there is enough lacto for people who are looking for it. Like all other Gose I've had; this one finished lovely and dry. It's a very tasty beer! The Kimmie, the Yink and the Holy Gose Ale from Anderson Valley Brewing Company is a serious mouthful to say. The beer is a lovely example of a traditional style of beer. The Australian craft scene is slowly catching onto the Gose trend, with both Feral and Nomad releasing good ones recently. I will try and get a review up of the Nomad in due course. In the meantime, go out and try this one if you are interested in what a salty beer tastes like, it's better than it sounds! Only really tried the Nomad (quite subtle really) and Willie the boatman's gose. Willie's was not subtle at all. Like drinking seawater.